at Tampa International Fringe Festival! Suggested for ages 13 and up, will be at the HCC Ybor City Campus Rehearsal Hall, at 1411 E 11th Ave, Tampa, FL 33605. Any performances starting prior to 6 pm (May 5 and 11) will be considered “family friendly” (with fewer curse words than the “adult version”). Tickets will be $15 for the General Public and $11 for Students and Seniors, and can be purchased online at tampafringe.org or at the door. Tim Mooney, of Breakneck Hamlet and Breakneck Julius Caesar fame, leaves behind his tales of the distant past, jumping ahead to the looming existential comedy awaiting us all at the tail end of climate change. From his narrow, lonely bunker, what may be last man on Earth plays out his own theatre of the absurd to the scattered remnants of a vast, empty planet. Realizing there may not be anybody left listening, Tim turns his attention to those corners of the universe that may yet be picking up radio waves, sharing lessons in how NOT to end up like we did! Along the way, he dreams up his own radical collection of “Ten Commandments” for whatever Klingons or Vulcans might still be out there listening! Check out the Man Cave Audience Reaction video on YouTube! 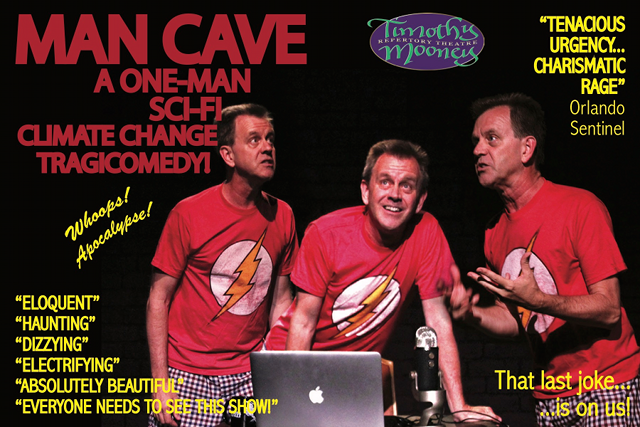 Man Cave is Mooney’s eleventh one-man play. Known mostly for hilarious romps through Shakespeare and Moliere, Tim has dabbled in the sci-fi before, most notably with the cult favorite Criteria a One-Man Comic Sci-Fi Thriller. 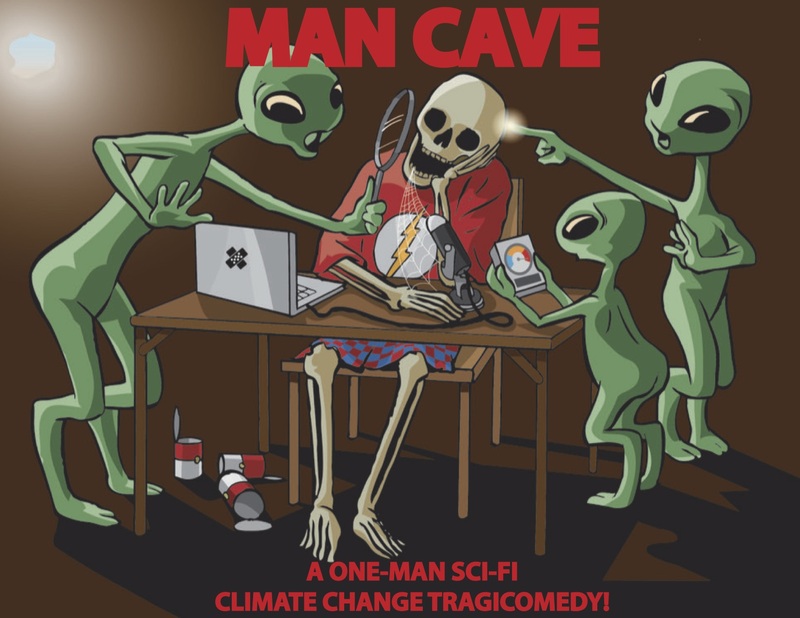 “I was actually inspired by another one-man show at last year’s Tampa Fringe Festival, which significantly rocked my understanding of what kind of a time-line we were facing with the climate change issue. And while that show projected forward with startling facts about what we might be facing in the very near future, it struck me that looking at the issue ‘backwards’ might be especially effective. What if we jumped ahead in time, looking backwards at the events that had brought us to the ultimate tragic end? What warning might the last man on earth have to send to the rest of the universe? Timothy Mooney, author of the new acting textbook, Acting at the Speed of Life; Conquering Theatrical Style, and The Big Book of Molière Monologues, has given over a hundred thousand students their first introduction to Molière through his one-man play, Molière Than Thou. Mr. Mooney is the former founder and editor of The Script Review and was the Artistic Director of Chicago's Stage Two Theatre, where he produced nearly fifty plays in five years. While most of Stage Two's plays were original works, when they turned to the classics, Mr. Mooney found himself taking on the hilarious world of Molière, eventually writing seventeen hilarious rhymed variations of Molière's plays with an impish sense of rhyme (most published by Playscripts, Inc.). These plays have been produced and celebrated around the world, with High School productions of Mooney's The Misanthrope, The Miser, The Imaginary Invalid, and Tartuffe going on to state finals in Massachusetts, Texas, Wisconsin, Virginia, North Carolina and Alabama, while his Doctor in Spite of Himself, took third place in the Scottish Community Drama Association National Festival, and was a finalist at Italy's Sanremo Global Education Festival. Tim, now operating at the not-for-profit “Timothy Mooney Repertory Theatre,” continues to present Molière across North America, along with Lot o' Shakespeare (featuring one monologue from every Shakespeare play), The Greatest Speech of All Time (actual historical speeches from Socrates to Martin Luther King), Shakespeare’s Histories; Ten Epic Plays at a Breakneck Pace! (also a book! ), Breakneck Hamlet, and now, Breakneck Julius Caesar! 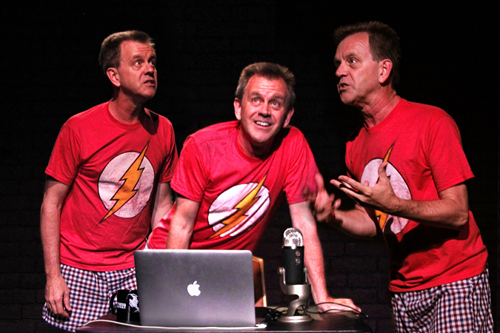 Tim also teaches classical performance and occasionally performs his one-man sci-fi thriller, Criteria!